Once Disney’s FROZEN came out to DVD we bought it to see what all the fuss was about. I still love watching Disney movies until this day. Having kids is a good reason to keep up with all the new movies coming out. We give the movie 2 thumbs up. 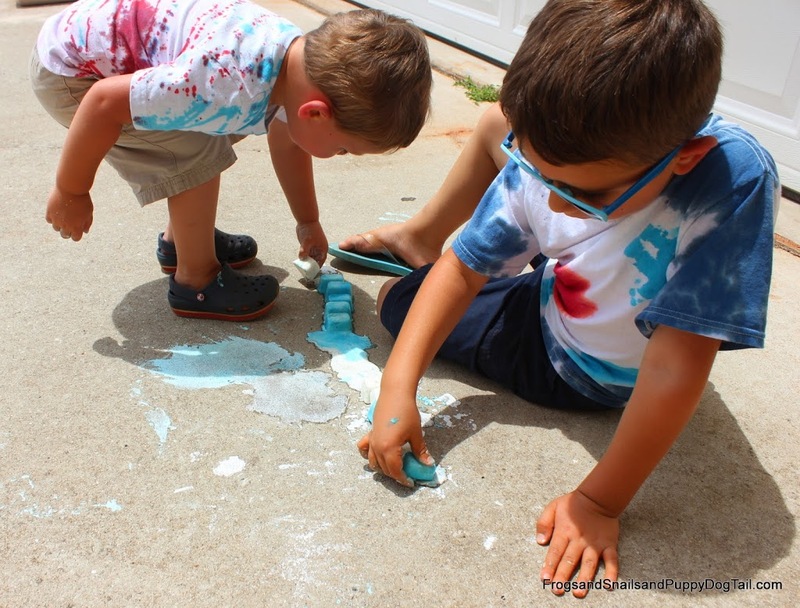 The other day while in the kitchen (where most inspiration seems to hit) I thought Frozen inspired ice chalk would be a fun activity for the kids. I saw frozen chalk on Reading Confetti last year and have wanted to try it since then. This seemed like the perfect time. I could not wait to see how the kids would react. Yes, I have all boys but I have stated before we are not against pushing baby dolls in toy shopping carts or reading Pinkalicious. We also love superheros and toy cars too. I grew up climbing trees, digging in the dirt, playing with transformers and barbies together. It just seems normal to me to mix things up when it comes to playtime. 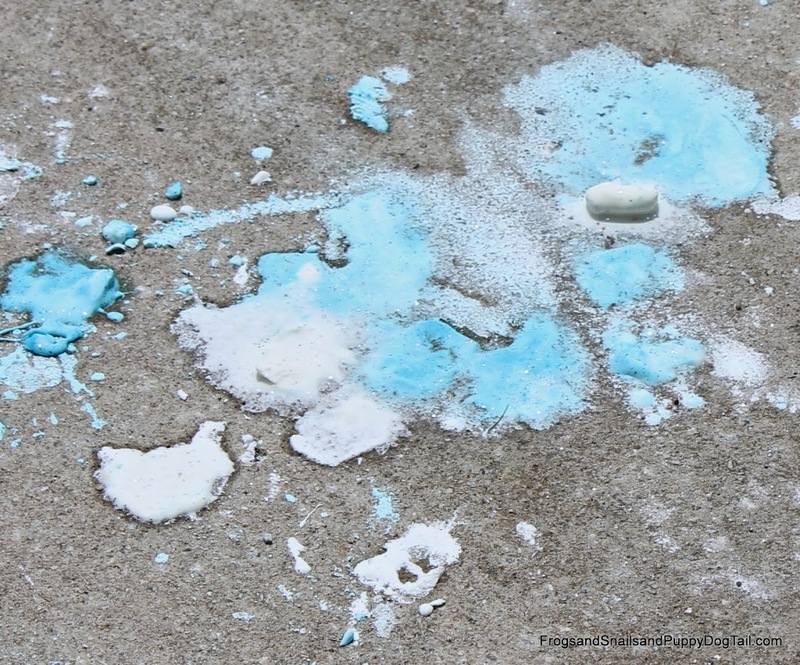 I set the ice chalk up on the driveway. All 3 kids came to check them out. They are 1yr, 3yr, and 5yr. 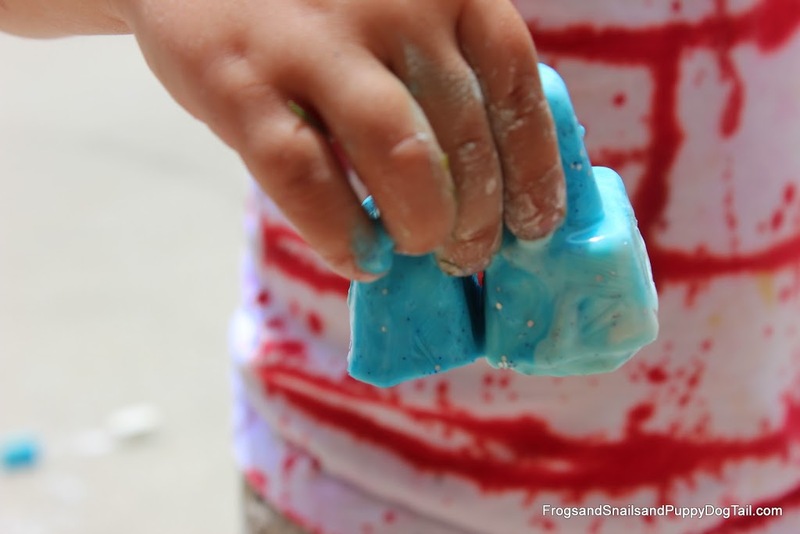 My oldest loves sensory and messy play. 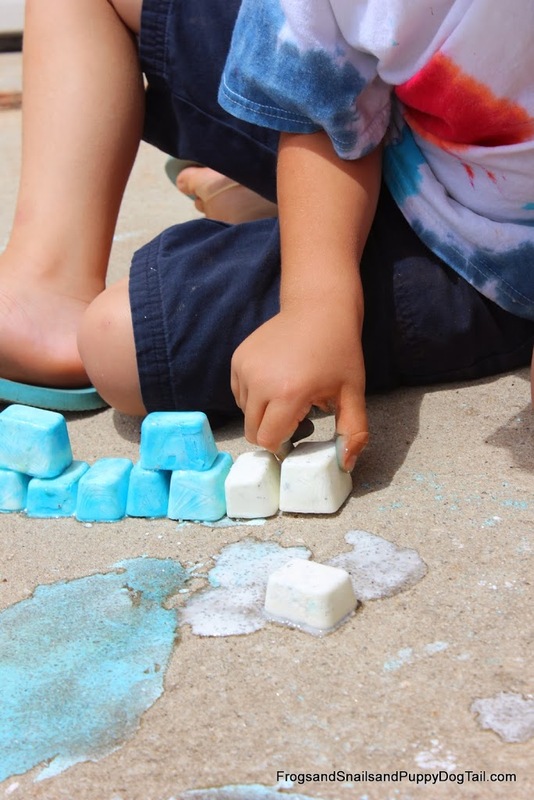 My middle child is so-so depending on what it is and sometimes has to warm up to an idea of the sensory play before he is all hands on. 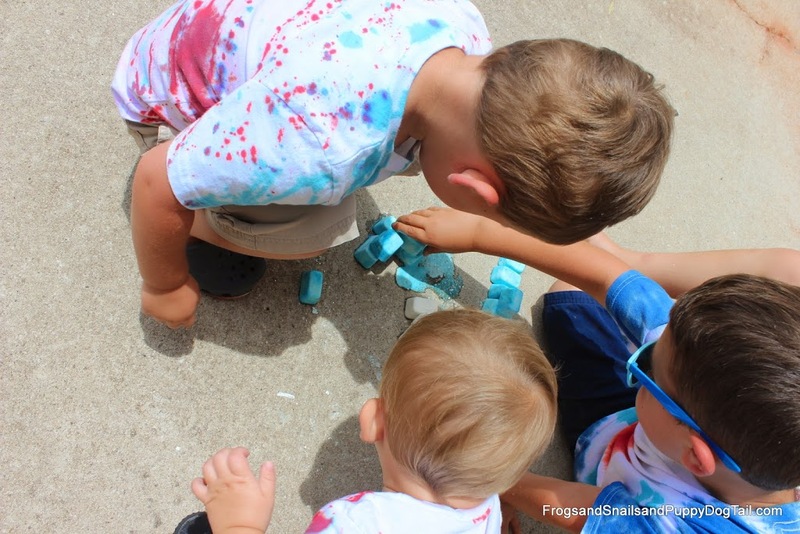 The youngest is being introduced to new sensory play materials all the time and he is following in the little brothers footsteps. As you can see above big brother is hands on first while the other 2 watch to start. 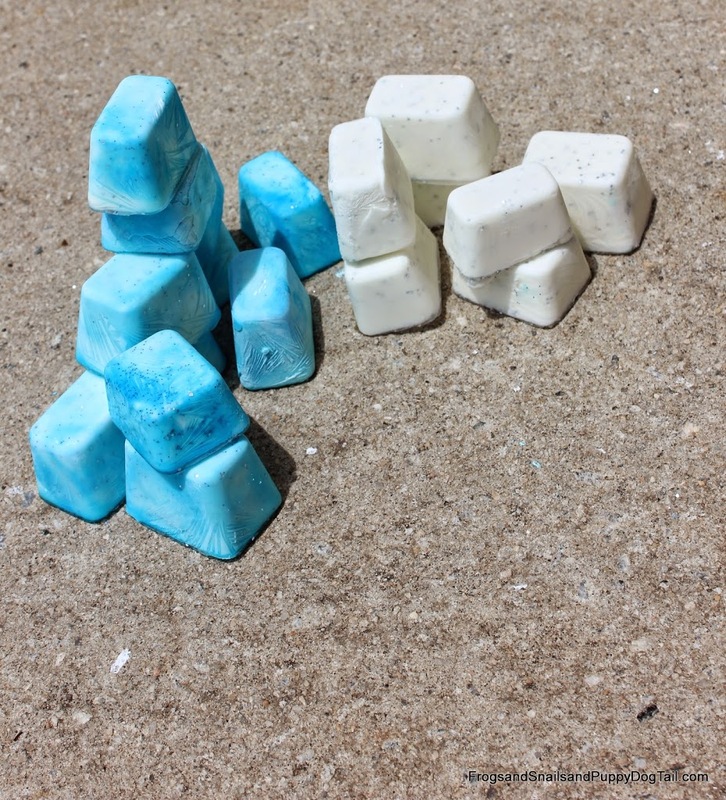 Big brother set out to use his imagination and build a frozen castle with his ice chalk cubes. Fun unconventional building block! Now little brother comes to touch and feel. He sees big brother is having fun so he wants to check it out now. Coming to show the camera that his ice chalk is stuck together. 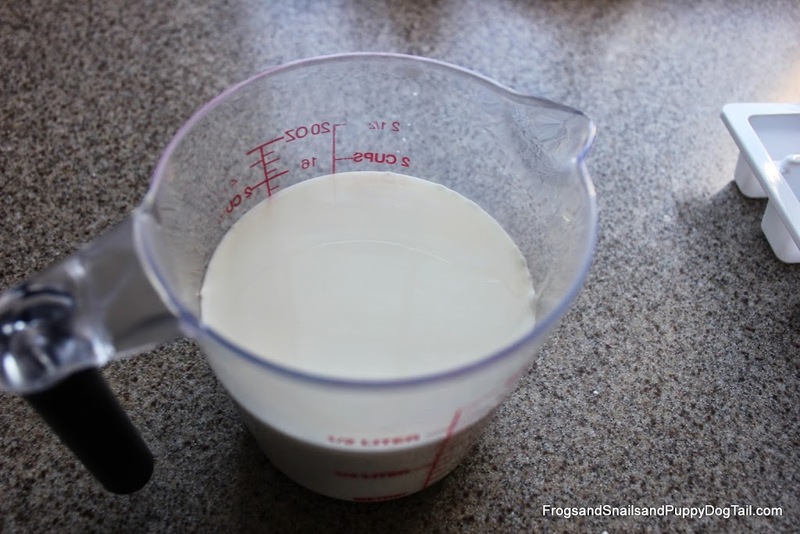 I mixed cornstarch (1 box) and water in a measuring cup(this is a dollar tree cup that I use for play recipes). 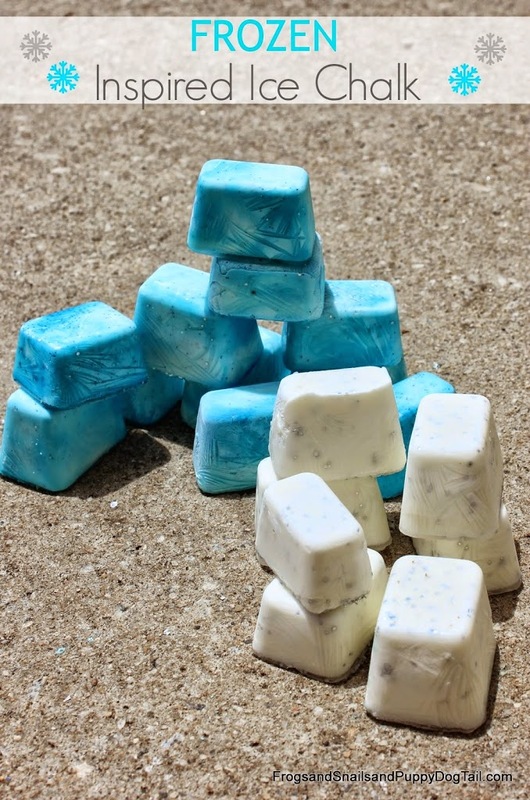 I then added a few drops of peppermint oil to it for scent. Then I added silver glitter to the mix. I poured this into the ice cube tray. After filling up one side I added blue glitter and blue food coloring. I only gave it one mix and then started pouring in the other side of the ice tray. I then put the trays in the freezer over night. 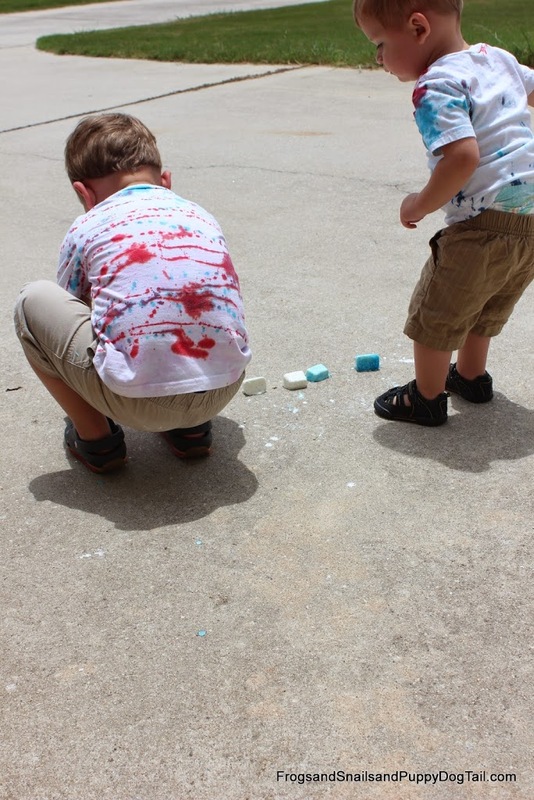 The Peppermint Glitter Colored Ice Chalk was a hit at my house in the end. We hope you can enjoy it too. What a great idea. 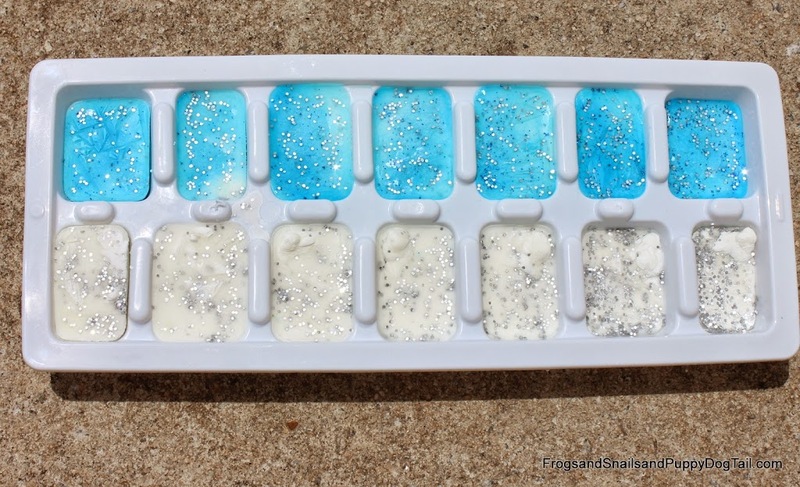 My kids love Frozen, so we’ll have to try this out. What fun!! We have friends with only boys who saw and love Frozen as well. Of course in our house (with a girl) it is Frozen most of the time. Thanks for sharing at Sharing Saturday! 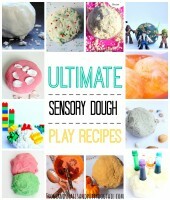 This is a fun recipe and I love how different your kids are when it comes to sensory (aka messy) play! Thanks for sharing with After School.